A project prepping & storing produce. 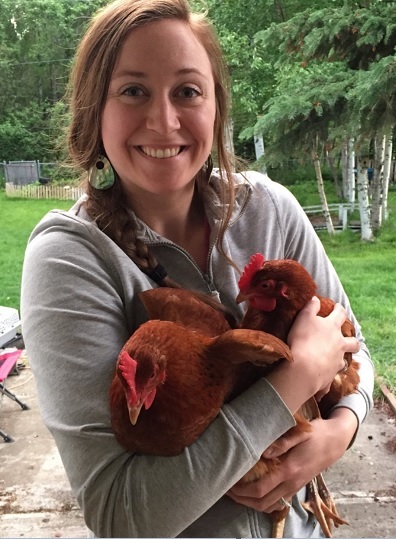 As Alaska’s growing season quickly turns to harvest season (AKA quick-pick-friggin-everything-before-the-ground-freezes), I knew there had to be Alaskans with backyard garden bumper crops they wanted to get rid of stat. After digging through Anchorage’s Craigslist (yep, I’m keeping this blog Craigslist-classy), I found a guy who over-planted his backyard garden with curly kale, and he was ready to till for the season. The ad touted, “free organic kale,” whatever you want to pick, it’s yours. That’s what inspired my recipe for curly kale and creamy white cheddar soup. Organic, locally grown kale. Score! 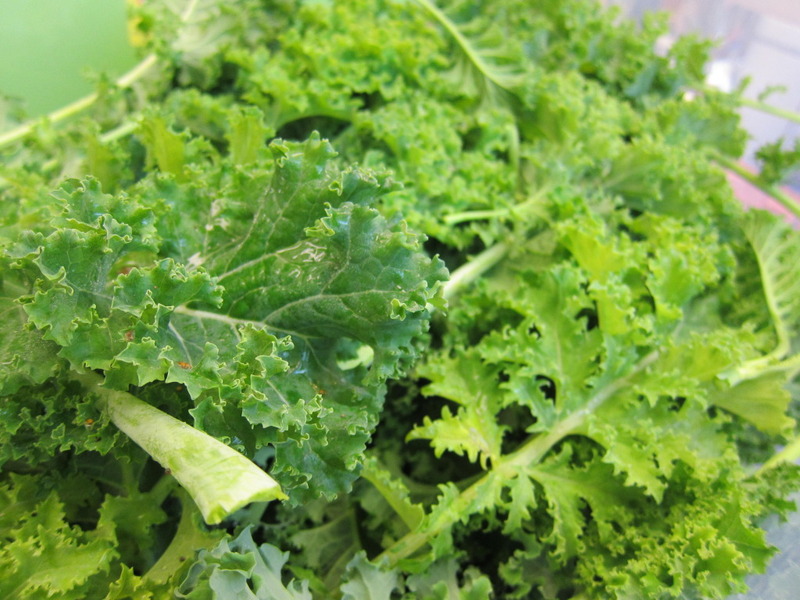 Like most leaves, kale has a stem that runs through the center of it. Depending on how big the kale leaf has grown, I noticed that this stem can be tough. With smaller, younger leaves, it’s not as big of a deal because it’s still tender. When Anna (my lovely friend who helped me pick & prep) and I were washing and prepping, we tore the curly leaves off the stem, then ripped the greens into small pieces. I’m sure you could eat that center stem piece, but it would be tough compared to smaller, more tender leaves. 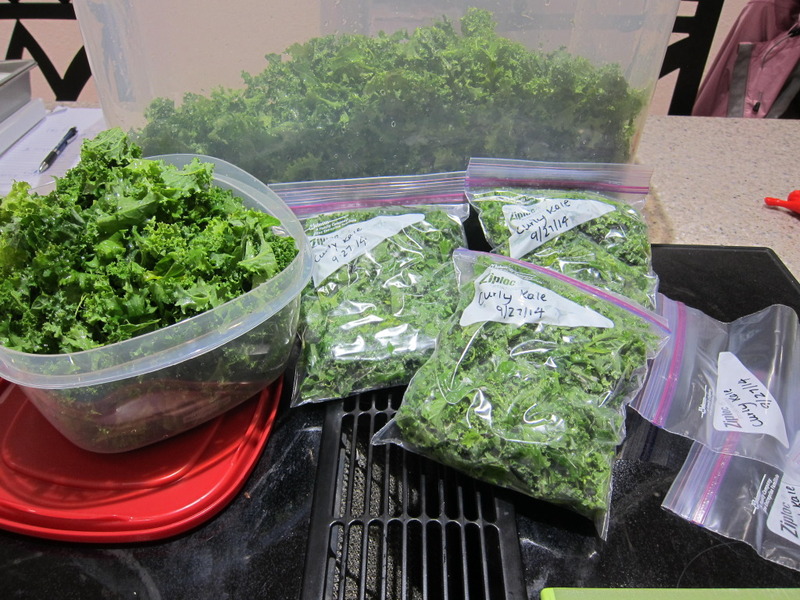 After washing, de-stemming and tearing the curly kale, I portioned it into freezer-safe, quart-sized ziplock bags. From what I’ve been reading, you’re supposed to blanch it (dunk it in boiling water for a few minutes) then pat it completely dry before freezing, otherwise kale loses its bright green color in the freezer. Did I blanch or pat dry my kale? Nope. That’s too high maintenance for this gal. I guess I’ll soon discover if there are any other consequences to not blanching before freezing, but I figured since I would always cook it first, I don’t care about the color. I don’t like bitter or really green-tasting leaves, but they’re so good for you! To reduce that bitter flavor that fresh curly kale can have, I decided to cook it in a soup. Now let’s get to the good part – the recipe. If you’ve NEVER made a cream-base soup before, start reading here. If you have made a roux before, skip this section & start at the next header. do not pass go; do not collect $200. When you’re making a creamy soup, the cheese and cream won’t blend well with water/stock. A roux is a way of getting your cream, cheese and thickener (usually flour or cornstarch) to all be smooth and blended instead of having bubbles and floaty chunks. Ever make hot chocolate from powder? When you fill your mug to the top with water, then dump in all the powder, it takes a lot of mixing to get it smooth. BUT if you add just a little bit of water and mix in your hot chocolate powder, then add the rest of the water, you get a chunk-free beverage much faster. Making a roux is basically the same idea, but for soup. See? Not too scary. And now you know how to make cheese sauce, too! Boil the base together in a big pot, then as you’re waiting for vegetables to soften up and cook in the base pot, you make the roux in a different, smaller pot. Once your base and your roux are ready, remove both from heat and dump your roux into your base. Mix it up & serve. If you have made a cream-base soup before, start here. If you know what a roux is, all you probably need is the ingredients. This ain’t your first soup rodeo & I’m sure you know how to take it from here. 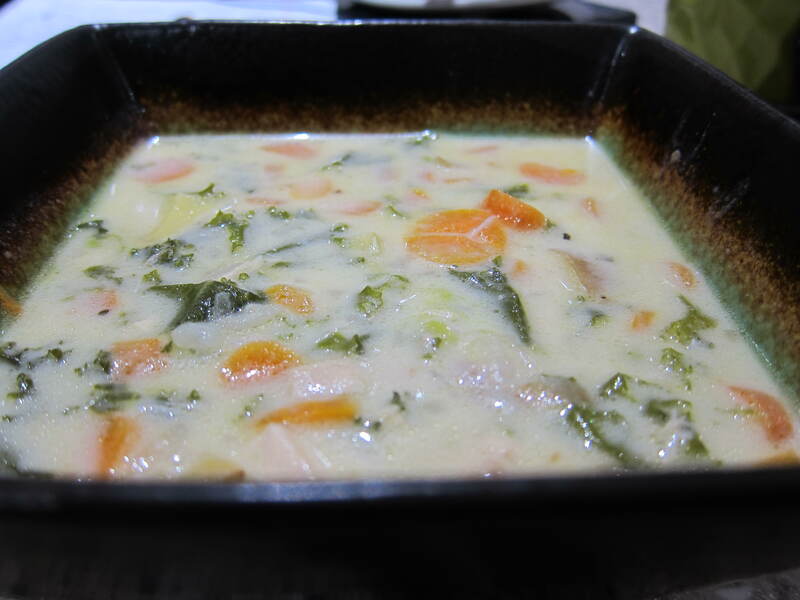 Here’s what I added to create my tasty kale and white cheddar cheese soup. * Makes about 4 big bowl-sized servings. The best part about making soup is that it’s easy to customize based on what you have available & your own personal taste preferences. If you prefer thinner soup, add more chicken stock. If you prefer a thicker, chowder consistency, add less stock. If you’re a vegetarian, use vegetable stock or water, leave out the chicken and toss in whatever other veggies you have on hand. Have fun experimenting with flavor combinations, thickness & batch size. I’m bad about eating leftovers, but I don’t like wasting food; soups are a perfect compromise. I love making hearty soups, because you can improvise based on whatever leftovers you have lingering in the fridge. Suddenly, that pan of boring leftover fried potatoes and that container of day-old steamed broccoli become a magical, new meal. Whatever blah leftovers you have on hand get an exciting new twist.